Oh man, you’re in charge of hosting a December dinner party. One of the guests is gluten free but no one else is. Ideas are scarce; you’re told to just ‘make anything; it’ll be fine.’ Meanwhile, you’re waffling over the selections in the gluten free section of the store, praying for help. Never fear, Chef Jill is here. And she’s going to save you with a creamy, calming rice dish that originated in the poorest nooks of Italy. If you’ve never made risotto before, it might seem a little daunting. 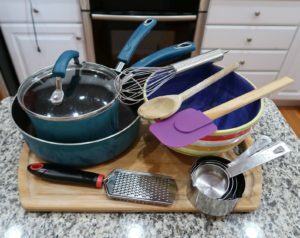 But, like with so many other culinary techniques, once you do it once, it’s easy. It requires a little tending, so bring your tablet or phone into the kitchen to keep you company while you cook. 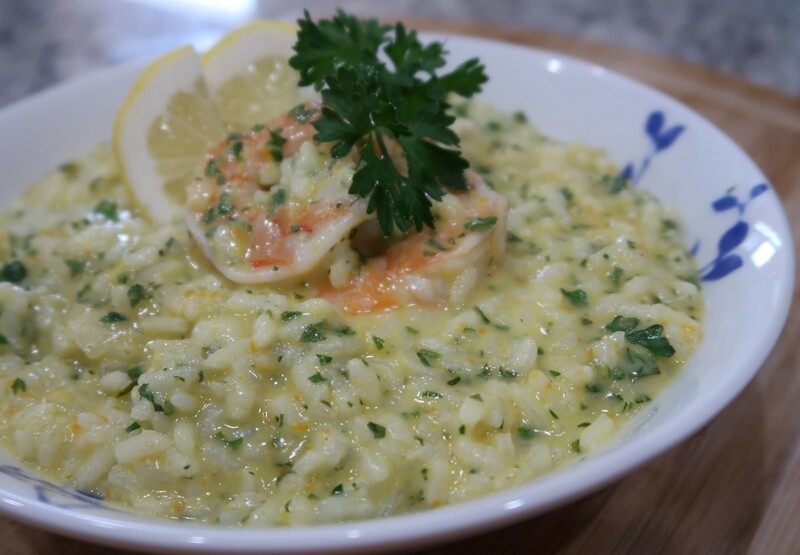 Risotto is versatile for just about every crowd. We made different flavors every week at the restaurant as a rotating special, one we could warm even the coldest hearts with. If you have a glass of dry white wine with it, it becomes an experience not unlike one in Rome or Milan. This variety is finished with gremolata, an Italian condiment filled with bright herb and citrus flavor. Feel free to substitute bruschetta, caponata or pesto for the gremolata to change the taste. Use other proteins like chicken breast, salmon bites or white beans to vary the experience, too. Risotto sits nicely alongside a green salad or antipasto, since it’s laden with dairy. Enjoy your warm, comforting meal and the company. If you need more tips or suggestions, I’m here to help! And, as I said before, you got this! Watch Chef Jill make this recipe! Got this in your kitchen? You can make risotto! In a medium bowl, add lemon, parsley and garlic. Stir to combine, then add salt and pepper. 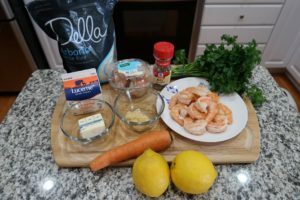 Stir in cooked shrimp. Cover with plastic and set aside. In a large pot, add oil. Place over medium low heat. Once oil is hot and streaky, add shallot and carrot. Stir and cook until fragrant, about 2 minutes. Add bay leaf and rice. Stir to coat grains with oil, then add 2 cups stock. Stir well, place a lid on and allow to simmer. Cook until nearly all liquid is gone, then add more stock in ½ cup increments, stirring after each addition, until rice is plump and tender. You may use more or less stock. Remove from heat. Stir in cream and butter. Adjust with salt and pepper to taste. Stir in prepared gremolata and shrimp to warm and incorporate. Serve with crusty bread and salad. Calories = 483; Total Fat = 18.2g; Cholesterol = 256mg; Sodium = 248mg; Total Carb = 48g; Fiber = 1.9g; Sugars = 0.8g; Protein = 32.8g. Reduce fat by: using light cream or unsweetened nut milk rather than heavy cream. Jazz it up by: adding roasted red peppers, sliced olives, pine nuts, shredded Romano cheese, artichoke hearts, capers or minced prosciutto.